At 24, Ankit Kawatra may not earn a six figure salary. But he is doing something to solve two important problems -- hunger and poverty. This is his inspiring story. Do you know what kills millions of people in the world every year? Not AIDS, TB, cancer or malaria. "It's hunger," points out Ankit Kawatra. 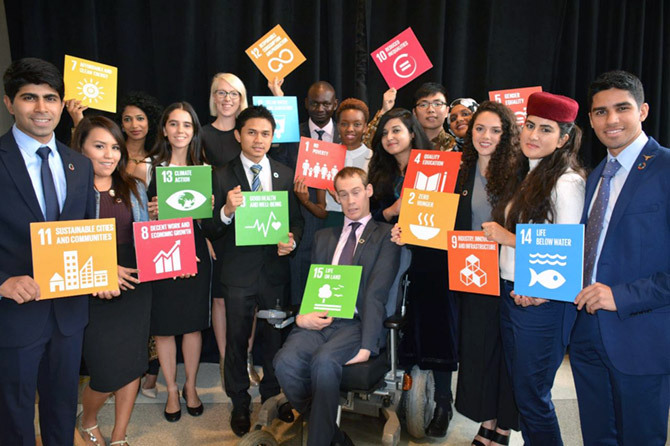 Delhi-based Ankit, 24, is one of the 17 young world leaders selected by the United Nations this year as part of the UN's 2030 Agenda for Sustainable Development. He represented India at the global summit in New York recently. The 17 leaders were recognised for their leadership and contribution to the achievement of the UN's 2030 Agenda which includes a set of 17 goals like end poverty, fight inequality and injustice, and tackle climate change by 2030. 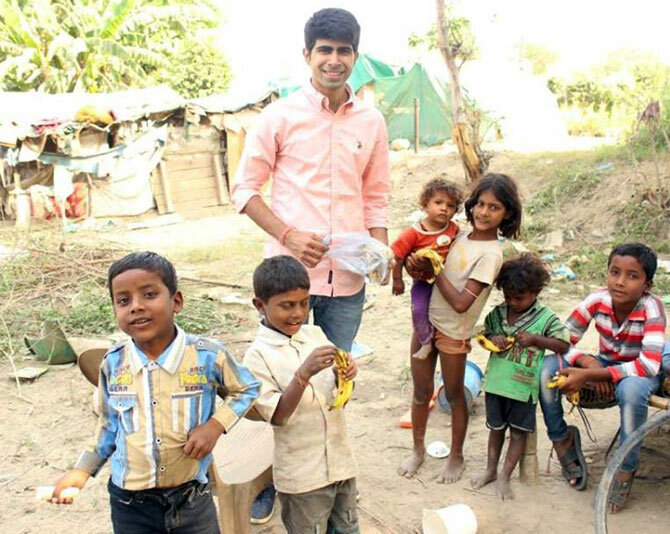 Ankit, who started Feeding India, a not-for-profit organisation after quitting his corporate job in 2014, is helping end hunger and poverty in India in a unique way. 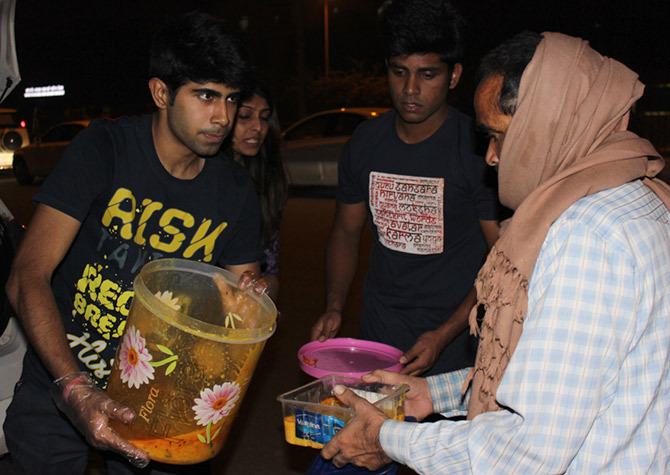 Through volunteers across 28 cities, he collects excess 'unused' food from parties, restaurants and social events and donates it to the needy. "20 crore Indians sleep on an empty stomach every day," he says. "Globally, 40 percent food produced is wasted in some form or the other." "If, in India, we can try and manage excess food, we can reduce hunger to a considerable level." Feeding India has facilitated one million meals in the last two years and aims to continue his quest towards his bigger and ambitious goal. "I want to make India hunger free by 2030," he says. Ankit lives in Delhi with his parents -- his father is a businessman and mother, a homemaker. His younger sister works at Ernst and Young. In a telephone conversation, Ankit tells Rediff.com's Divya Nair how it all started and how he plans on achieving his big dream. IMAGE: Ankit believes that if we manage excess food, we can easily cut down malnutrition-related deaths and deal with poverty better. What inspired you to start Feeding India? In 2014, I was attending a wedding. There were about 1,000 guests and 35 different items on the menu. When I had a chat with the caterer, he told me the food could easily feed about 5,000 people, but after the guests leave, all this food would be dumped. I was shocked to find that so much food would be wasted that day. And similarly, at several other weddings, family events, festivals and social gatherings. Through various incidents in my life, I had experienced how several kids and people in the slums sleep hungry because they cannot afford to buy food. I wanted to bridge these two situations, but I did not know how and where to start. It struck me that if I were to find a way to use the excess food to feed the hungry, it would be so much useful. That's how the idea was born. How did you do it the first time? My friend Akash and I were attending a wedding in Noida. I spoke to the caterer and at 2 am, when the wedding got over, he told me that the excess food could be consumed by about 500 people. I had no plan, but I wanted to test my idea that day. I asked my friend to join me and convinced the caterer to provide me with spare containers to carry the unused food. So, at 2 am, we put everything in the car and set out to locate people whom we could feed. Given the odd hour, it felt stupid and at the time, I felt excited to do it. We found a shelter home that had only 100 people. There was so much food that my friend was sitting in the front seat of the car with a container on his lap. On our way, we were stopped by cops who weren't quite convinced why we were carrying so much food at the late hour. They suspected something foul, so we had to convince them really hard. After a lot of driving around and making a dozen phone calls, we found a place where we could donate all the food. 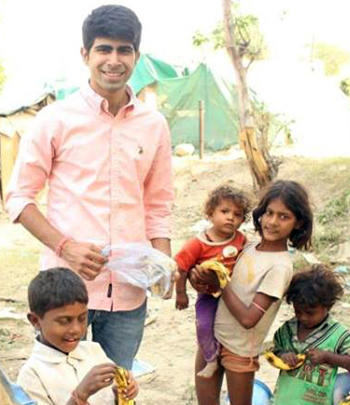 IMAGE: No matter what time or day, Ankit and his team of volunteers are ready to help. It wasn't a planned move at all. I was just too overpowered by the thought of finding a solution to manage food wastage. One night I switched off the lights in my room and started talking to myself about this problem. I did not want to be complaining any more, I wanted to find a solution. The next day, I wrote a letter to my manager in the US office mentioning that I'd like to resign. He thought I had found something better, so he didn't question much. I did not inform my parents too. I was on notice for two months. I used this time to research food quality and food waste. I spoke to several NGOs and caterers who could help me. When I started sharing my ideas on social media, my friends thought I was going to become a politician or social worker. They did not take me seriously. They came to know pretty late and they weren't quite happy. They liked the idea, but just like everyone else they wanted to know how it would help me financially, whether it would take care of my future. I wouldn't blame them, I did not have a plan. I was experimenting and taking a big risk. They have supported me all the time and they are proud that I was selected as a young global leader by the United Nations. What kind of problems did you face when you started? My first challenge was to convince the caterers to give me the excess food. They wanted to know what I would do with it. It was absurd how some of them wanted me to charge me per plate for food that would have otherwise gone into the garbage can. I told them I wasn't benefitting from the activity. I was just feeding the hungry. With restaurants, it was a different story. Most of them did not want to be associated with trading excess food. They'd rather dump it away than get into trouble. What if the food contaminates when taken outside? The brand wouldn't want to take responsibility for it. We understood their concerns and worked out a deal where the restaurant authorities would not be responsible for the food once it leaves their premises. How do you ensure that food is fresh? Before taking up the activity, we ensure the food is fresh and unused. There are certain quality checks like PH value that we take into consideration. The beneficiary must be located within a radius of five kilometres, so there is less time in transportation. The food must be consumed within 90 minutes. So what happens when there is excess food? If you find there is excess food at an event, you can call our 24x7 helpline number (98711-78810). Our representative will ask for details like quantity of food, approximate number of people it can serve and how fresh it is. The next step is to find out if there is a volunteer available in the area. So far, we have 2,000 plus volunteers in 28 cities. These volunteers coordinate and help us transport the food to the needy areas. Usually, within five to ten minutes of making the call, we respond to tell them whether or not we can do something about it. On an average, we get about 1,000 plus calls and e-mails from different cities of which 50 per cent have to be turned down either because we don't have a volunteer or beneficiary who can complete the activity in a desired time. (Laughs) No, not yet. I had some savings which I have invested in this project. We started off as a not-for-profit organisation which explains I am working with volunteers who are committed to the cause and are sharing their feedback. Right now, I cannot afford to pay people, so I am hiring them for a period of six months like an internship set-up where they explore different aspects of Feeding India. Simultaneously, I am working on a sustainable funding model. 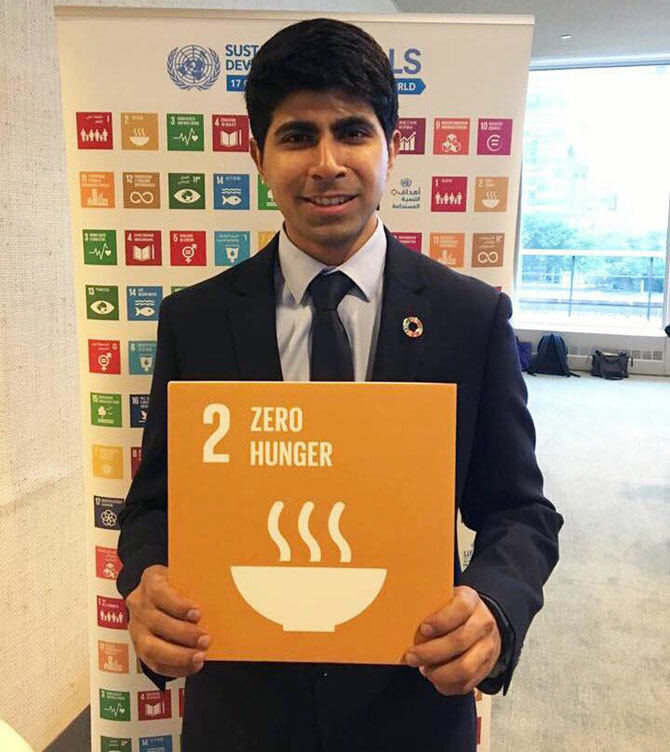 IMAGE: Zero hunger, says Ankit Kawatra, highlighting his goal ahead of the UN summit in New York. When I started off, I was against donations. But now, I have opened up to the idea. I am looking at partnerships and crowdfunding so I can expand the idea to more cities. In December, we raised Rs 10 lakhs (Rs 1 million) through Ketto, a crowdfunding platform, but fell short of a lakh-and-a-half (Rs 150,000) to buy a Magic Truck. This truck costing Rs 11.5 lakhs (Rs 1.15 million) is my dream project -- it will travel across the city and collect food which will be donated to the poor. Instead, with the money, we rented a van which is operating in Gurgaon. This Magic Van has a refrigerator which stocks up food collected from corporate organisations and feeds people from the slums. How much of a difference do you think you have you made in the last two years? I wouldn't know the statistics, but I see a huge shift in the way people deal with food wastage. At a wedding I attended in Rajasthan, I saw placards saying: Take only what you need. Don't waste food. In India, if you tell someone 'Don't take more food' they will take offence. Instead, you need to tell them differently and they'll slowly notice and change their ways. How can India deal with poverty and hunger better? India is a land of celebrations and food is an integral part of everyone's lives. As precaution, we always make more food than is desired, but we do not have a system to utilise this excess food. It's like this: You are living in a house alone. Every day, you dump your clothes in a corner and don't arrange it, either because you are lazy or busy. As days pass, there is a pile in that corner but you do not notice it. When someone enters your house, they notice that pile and tell you it's so messy. It was right in front of you, you created that pile, but you did not do anything about it. That's how India's problems are. We are all slowly adding to the pile by simply sitting quiet, not doing anything about our every day problems. When a foreigner visits India, s/he notices this pile, this filth and complains. We can either ignore, and call it a problem or find a solution for it. We cannot change people overnight, but we can make a small difference every day. 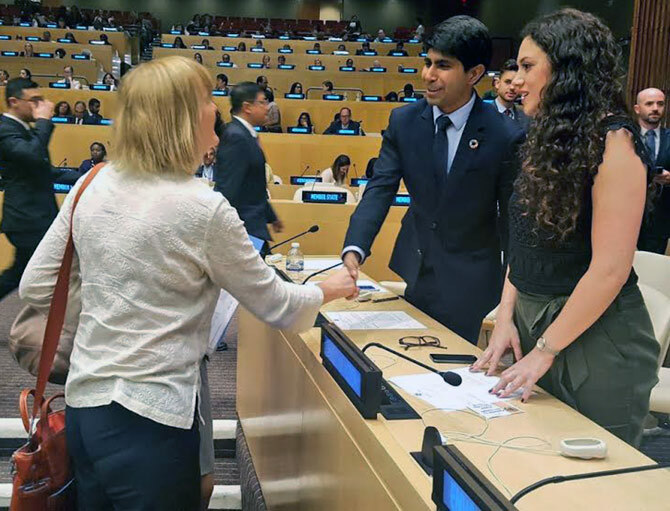 IMAGE: Ankit interacts at the UN Young Leaders Summit in New York. Describe your experience of attending the UN Young Leaders meet. It was an awe-inspiring, eye opening, event. It was like living a dream. Through the three days I spent there, I was surrounded by world leaders, young changemakers, who had defied odds and had a bigger dream for their society, country and planet as a whole. The fact that we were selected from 18,000 applicants from 186 nations made us feel extra special. We were sitting in a room with people we had seen only on world TV -- (US President Barack) Obama, (UN Secretary General) Ban Ki-moon discussing the world's problems. The purpose of the meet was simple -- the idea was to encourage young people to come up with solutions for world problems -- poverty, hunger, education, jobs, environment and global peace. Through our interactions, it became clear how these problems were interlinked. It was encouraging to know that no one had done anything about managing food wastage before and that every other country would like to adopt the idea. Some of them suggested that I should change the name from Feeding India to Feeding International. That meant that I was addressing a universal issue and I had taken the first step. IMAGE: Ankit, extreme left, with other youth leaders at the summit. I want to tie up with corporate organisations who can step forward in this cause. I want to set up Magic Trucks in all the metros and sooner or later expand to other cities. There are countries that are using potato peels to feed the hungry. I am looking for interesting models that can create awareness and end poverty and hunger. Eventually, I am planning to partnering with organisations and young leaders to facilitate education as part of the activity. It's a three-fold goal -- Zero Poverty. Zero Hunger. Better Education. World's most desirable man is an Indian! Why did Facebook gift this student Rs 21 lakh?